Following on with my quest to complete as many of the CWGC graves in churchyards close by, I decided to head to Hook, and from there to visit the churchyards of Newnham St Nicholas as well as Rotherwick Parish Church. Hook is the next stop from Basingstoke on the line to London Waterloo and I was there by 10H30. I had some sort of plan in mind, and it really depended on my energy levels. The first part of my plan included photographing the Hook War Memorial. And from there starting the long walk to my destination which was roughly 2,3 km away. I am not too keen on walking these country lanes because they are narrow and often have blind bends. There is no real pavement either so it can be risky, but the job has to be done. Eventually I came to the junction that I needed and turned left to the church. It was a very pretty spot, and with Spring not too far away and a luke warm sun it really made for a nice day. There are 4 CWGC graves in Newnham St Nicholas churchyard, of which two are private memorials. The lychgate is magnificent (as these lychgates tend to be), and is dated 1910. The church itself is very much older. Like so many of the churches I have come across in my meanderings it is really difficult to date its origin because of all the changes that were made during the history of the church, at any rate it seems to show up in history round about 1130. 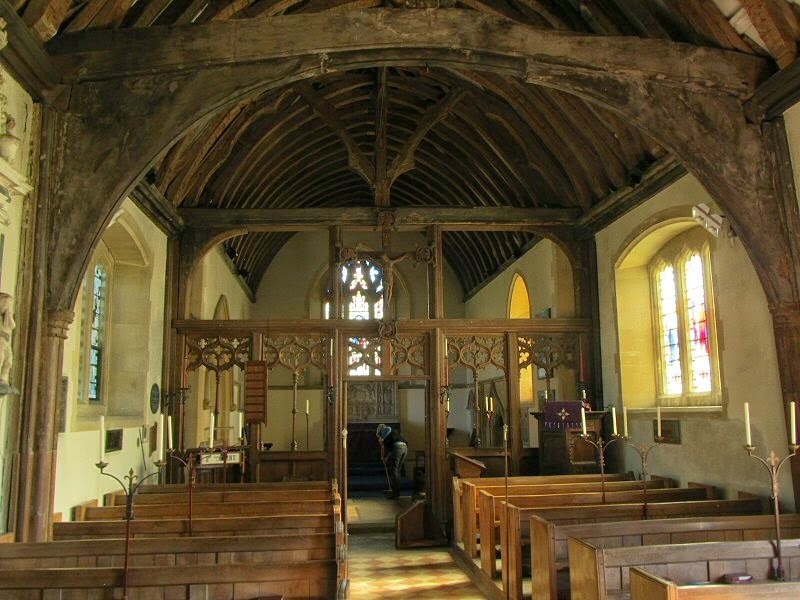 The chancel arch has been dated to about 1135, with major restoration being completed in 1848. A more complete history of the church may be found at its website. And like so many of these small parish churches it is not easy to get an image of the complete building, but there is at least one spot where you can make a good attempt. My first grave was an easy one, it was amongst the first graves in the churchyard by the gate. And the churchyard was quite a nice one too, well shaded, lots of very old graves, and the occasional gem that makes you gasp. There were a number of cast iron markers in the one area, and I had seen quite a few of these in Southampton, but not too many in Basingstoke, I had also not seen this style of cast iron marker before either. They were really nice, but sadly a definite target for scrap metal thieves. In the one corner I found two of the other graves I was looking for, as well as a really pretty collection of moss encrusted graves. These seemed to be of previous ministers of the church, and possibly a few important locals. I still had one more private memorial to find and there was no description of what it looked like. I explored further, working my way around the church. My soldier was a World War 2 casualty and the area was now looking much more promising, although the graves immediately next to the church all dated to the 1800’s. I started at the top and started checking each grave, hoping that I was not looking at a toppled headstone or an illegible inscription. Then I hit paydirt and I was able to tick him off the list too. The rent was paid, now I could explore. I headed back to the rear of the church where the entrance was (the entrance does not face the lychgate), and found that the church was open. Inside I met the vicar, and he told me a bit about the church and the various war memorials in the church (of which there were 4). It is not a very ornate building though, it’s much smaller than it looks from the outside, but has a humble feel about it, and a friendly atmosphere. Interestingly enough the oldest identifiable grave in the churchyard is that of Mary, daughter of Peter Justice, who died 14 August 1728, aged four months. The vicar also showed me a safer route to Rotherwick which clinched my decision to head there next. All in all though this was a pleasant visit, and getting into the church was a bonus, because some of these churches have wonderful wall monuments in them, as well as war memorials to the local parishioners which seldom see the light. My next destination was roughly 2,8 km away and a short detour would take me through Tylney Park Golf Club and past Tylney Hall Hotel. The hotel is quite an interesting one, and I was hoping to get a chance to have a good look at it. Unfortunately as I arrived at the hotel my phone range and I had to speak to a personnel agent so ended up taking pics on the fly, and missing out on a lot of what there was to explore. What is interesting is that in 1919 both the Hall and much of the original estate was acquired by Major Cayzer, later created Lord Rotherwick, owner of Clan Line Steamers Ltd, and the Hall became the headquarters for the shipping line. A previous owner had been Sir Lionel Philips, but whether this is the famous Baronet from Johannesburg history I cannot say. Irrespective though, from what I saw it was magnificent, I just wish I had been able to see more of it. Unfortunately though, my distraction did take me away from the buildings and I was not in the mood to turn back. Besides, I still had some graves to find. And that was still a long walk away. Finally I arrived at Rotherwick, and the church was easy to find. It is not a big church, but again it is an old one, or should I rather say, there has been a church at this spot for a long time. More information about the church may be found at it’s website. I had two CWGC graves to find, and I started my round of the church. There was not a lot of space in front of the church, the major part of the churchyard was behind the church and that was where my two graves were. The churchyard was evidently still being used, and it was quite a large space, slightly separated from the original churchyard. Sadly though, at some point a lot of the old headstones had been uplifted and used as a wall at the bottom of the church. It was nicely done though, not a haphazard leaning of headstones as I had seen in so many other places. Getting a pic of the church was difficult because of the sun, and because there was no real spot far away enough to fit it all in. I would have to go outside the churchyard to do that. The walk was uninteresting, dodging from side to side of the road to avoid blind bends and impassable pavements. I was starting to tire too, and the sun was starting to hide behind clouds that were forming. I was ready to give up for the day. I had one more church to see, and it proved to be one of those modern featureless churches, with the cemetery next to it. The cemetery was a modern one, but there was nothing really to see, so I took a quick walk around and then headed off to the station. It had been a productive morning. Two more sets of graves had been added to the record, and 220 images had been taken. I had seen some really nice headstones, as well as a really pretty church. I enjoy these rural settings because every now and then I see something that literally takes my breath away. Maybe it is the countryside, or the history all around me, or just maybe I feel an affinity with here, it is the type of place I have had in my mind since I was a child, and the sort of places I read about in books, and what I was seeing did not disappoint. While the weather is reasonable I started to tackle the graves that I could assist the British War Graves Project with. One of the places on this list is Sherborne St John, a small (and really old) village roughly 1,8 miles from where I live. Its not an impossible walk, but a blocked road meant I had to make a considerable detour from my planned route. The walk was a bit dangerous, taking me through country lanes that have no pavements or places to dive into when about to be run over by a maniac on a cellphone driving a German sedan. The area became rural very quickly, and very pretty too. It always amazes me how different the UK is from back in SA. I kind of like the all pervading green; in South Africa the grass would have been dry and dead and dismal. In the UK it is green and lush and kinda muddy underfoot. My target was St Andrews Churchyard, with two CWGC graves in it, one of which was a Canadian nurse. Fortunately navigation within Sherborne St John was straight forward and before I knew it I was at the church. I am really becoming a fan of these lytchgates, some are really beautiful, and this one was no exception. This particular one had a brass plaque on it,which made me think about how much has passed through that small wooden construction, and how many only made the passage in one direction? The churchyard was startlingly beautiful, it was just one of those places that took my breath away. I am always amazed to see some of those old graveyards and churches, the sense of history you get once you stand amongst the headstones is just so amazing. It is just so difficult to imagine the lives of those who are buried here so many years after the fact. Of course it is not only the lives of the people, but the country that they lived in which has changed, they could never have imagined the era we are in now, but it is equally difficult to transpose yourself backwards through time to walk these pathways and see these headstones when they were newly laid. My first CWGC grave was easy to find, the distinctive headstone against a hedge did not really need much looking for. However, the second would be more difficult as it was a private memorial, which meant I could be looking for anything. Fortunately I found my nurse, and was able to photograph her grave so very far from her home. I am especially fond of finding graves like this because the families may never have seen these graves, and its only since photography has become cheap and easy that we are able to finally take the photographs, but unfortunately too many years too late. My original Google Earth view had indicated that there was an additional cemetery/churchyard not 100 metres from the church, and it was probably an overflow from the original graveyard. I headed towards this next. My supposition was correct, and the graves here are relatively modern, although some of the headstones really look as if they are much older. The row of Yews encompasses a war memorial which I photographed too. These memorials often contain names that do not always exist on Rolls of Honour and its always a good idea to have the names off them. That was it. Time to head back home. My route would take me past the local duck pond to quack at the local ducks. They probably thought I was quackers. My initial thought was that it was the headstone of a child, or possibly a dissenter, however I did find other graves there, and it was very possible that it was the footstone of a grave, the headstone having been toppled. That’s part of the frustration about gravehunting; there are just no hard and fast answers to any questions that you may have. This wooden fence was interesting though because there were graves on either side of it, which led me to think that it may have been a paupers or dissenters area. The answer is probably buried in history, and I would not have an answer on this day. Time was marching and I still had to get home before the light started to fade. I was very tempted to root around in the area a bit more, but I decided to leave it for another day. I have another graveyard to explore in a village close by, and just maybe I will be able to include a return visit to this one too. I know I would love to get into the church. And that was it. I was on my way home. It was a fantastic graveyard, with some really beautiful headstones and the inevitable mystery. And of course there were family plots, and soldiers and lichen, and that made it my sort of place. Following on from my trip to Monk Sherborne on Christmas, I wanted to update this post slightly. The church is not too far from there, and I came home via Sherborne St John as I wanted to see if it was possible to see the inside of the church. A service was in progress when I arrived, but ended shortly thereafter. I was able to get into the church, and it was really very pretty, but could not take any pics because another service was due to start almost immediately. There are two separate war memorials in the church and I may see about heading out there again one day to get pics of them. The one odd thing I saw was 4 scooters “parked” close to the gate, and parishioners walking back from the service. It brought back many memories from when we used to attend church back when I was young, although the clothing was much more sombre and less colourful amongst the people. I am not quite finished here yet, there may be another update one of these days.